You can combine multiple simple objects that overlap; together with the Merge, Subtract, Intersect, and Turn-to-Path functions, you can create one complex object of arbitrary shape and color. 3. Go to the menu Drawing –> Path operations and select Merge selected objects together – the two objects will merge into one. You can also select the desired function from the GUI Toolbar. This feature is opposite to the Merge function. You can subtract portions of a bigger object to create a new object of the desired shape. 1. 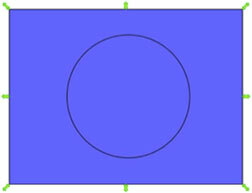 Select objects and make sure the outline is in the desired shape of the final object. Then select the inner object that you want to remove. 2. 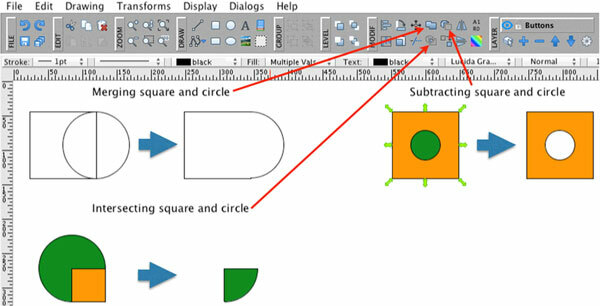 Go to the menu Drawing –> Path operations and select Subtract objects. You can also select the desired function from the GUI Toolbar. This feature creates a new object from an overlapped area of two different objects. 1. 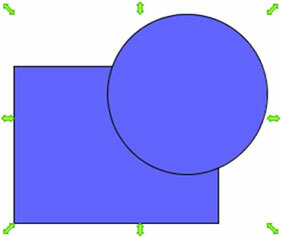 Arrange two arbitrary objects so their overlapping pieces make a desired shape, and then select the objects. 2. Go into the menu Drawing –>Path operations and select Intersect. You can also select the desired function from the GUI Toolbar. Now you have a new cutting ready to be formed into a desired shape by clicking and dragging the surrounding dots. This feature allows you to transform the objects e.g. Changing primitive objects to complex paths. Go to Drawing->Path operations->Convert Selected Objects to General Path Objects. You can also select the desired function from the GUI Toolbar. 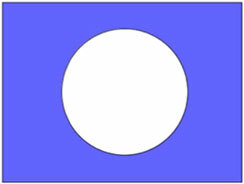 You will see a series of points appear around the object. Simply drag the surrounding points to achieve the desired shape.